The market research bureau, Counterpoint, recently released global mobile phone shipments data for Q1 2018. 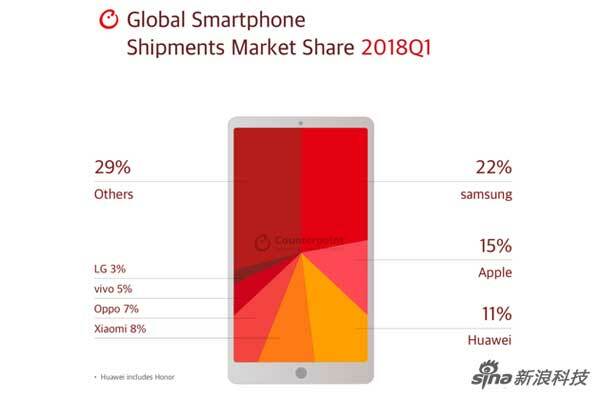 From data released Counterpoint, globally, Samsung is in the top position in terms of shipments of smartphones and mobile phones in that period. For the smartphone category, Samsung managed to ship 78 million units of the total shipments of 360 million units and secures 22% market share. Meanwhile, nearest rival Samsung, Apple is in second position after mangamankan 15% market share achieved with shipments iPhone as much as 52.2 million units in the first quarterly period this year. In third place is Huawei (including Honor) who managed to secure 11% market share, followed by Xiaomi and Oppo who respectively occupy the fourth and fifth position. Xiaomi who is in fourth position has a market share of 8%, while Oppo followed with a 7% market share. Specifically, when referring to Counterpoint data for each region, Samsung's capture dominates. This South Korean vendor's market share outperformed other vendors, particularly in Europe, Latin America and the MEA (Middle East and Africa). In Asia alone, Huawei, Xiaomi, Samsung, and Oppo have 13% market share, followed by Apple 12% in fifth. While Apple looks to dominate the North American region, with 38% market share. Still from data released Counterpoint, in general global smartphone shipments decreased 3% year on year. From the vendor side, Samsung experienced a 3% drop in shipments, while Apple captured 3% smartphone shipments. From the same data, Xiaomi achieved the highest shipment increase with 101%. During Q1 2018, Xiaomi managed to send 27 million smartphones versus 13.4 units in the same period last year. 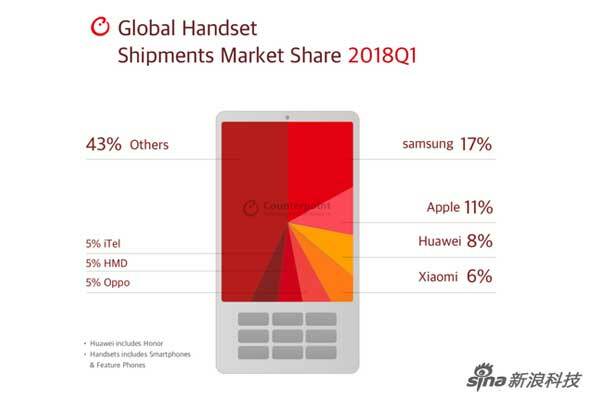 Meanwhile, when referring to handset shipment data (including smartphones), Samsung remains in the top position with 17% market share followed by Apple with 11%, Huawei 8%, Xiaomi 6%, and Oppo 5%. 0 Response to "Here's the Top 5 Smartphone Vendors in Q1 2018"